PAUL P. PRUSS & SON, INC. When you're faced with a tough cleanup challenge or a time-sensitive project, you want a contracting service you can trust, and you want the job done right. At Paul P. Pruss & Son we've developed and adapted our equipment for thorough and cost-effective problem solving. Our special systems combine a unique chemical cleaning method with Butterworthing for fast, thorough clean out of tanks and process vessels. We can clean a typical 10,000 gallon tank in one day and have the ability to clean tanks well over 100,000 gallons. Our mobile high pressure jetting delivers up to 10,000 psi to loosen process and waste residue from sewers and process equipment. High pressure jetting is also a cost efficient method of cleaning building exteriors and floors. Pipelines can be cleaned using chemical cleaning solutions or high pressure jetting. A water tornado removes debris from the walls of the pipe. Our specially designed equipment allows us to clean piping over 1500 ft. long, up to 30 in. diameter. For fast, thorough clean out of tanks and process vessels. 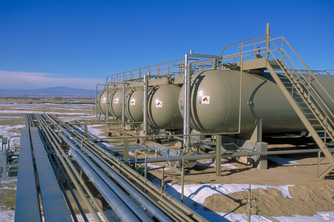 Our experience includes major turnarounds for leading refineries. We can work closely with your maintenance department to expedite plant turnarounds in a timely manner. Ongoing programs based on your maintenance schedule can help you avoid unscheduled downtime.